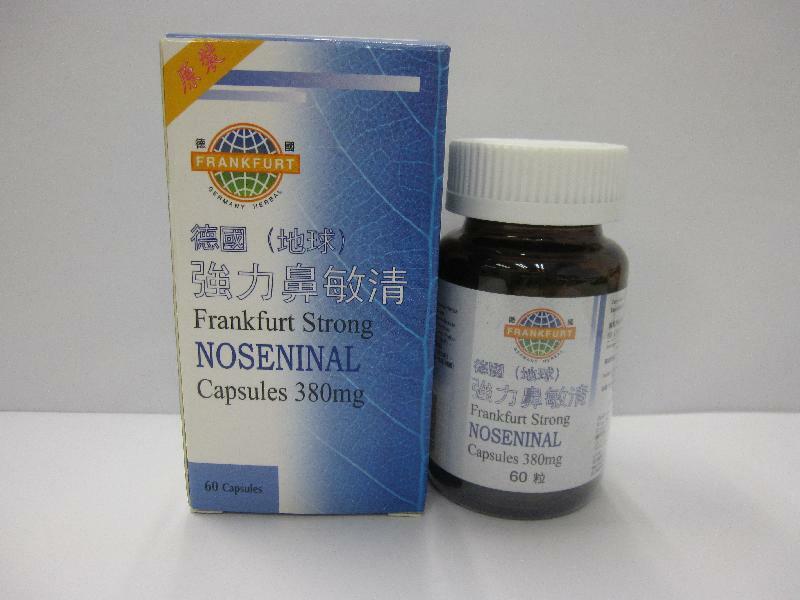 The Department of Health (DH) is today (June 6) investigating a licensed wholesaler of proprietary Chinese medicine (pCm), Wing Wui Medicine Group Company Limited, in Wah Fat Industrial Building, Kwai Chung, for suspected illegal sale and possession of an unregistered pCm called Frankfurt Strong NOSENINAL Capsules 380mg. Investigations revealed that the name of the above unregistered pCm and its labelled ingredients were the same as those of another registered pCm with the registration number HKP-04987. The packaging was also very similar to that of the registered pCm. The above unregistered pCm was found during the DH's market surveillance and it was found not bearing any pCm registration number or name of a registration holder on its label. Preliminary enquiries showed that Wing Wui was its sole agent for local sale. Its package insert claimed it to be indicated for allergic rhinitis as well as acute and chronic rhinosinusitis. "The use of unregistered pCms may pose threats to public health as their safety, quality and efficacy are not proven. We noted that Wing Wui is voluntarily recalling the above unregistered pCm from consumers and has set up a hotline (2362 7808) for related enquiries. Investigations are ongoing. We will closely monitor the recall. So far, no related adverse reports have been received," a spokesman for the DH said. According to section 119 of the Chinese Medicine Ordinance (Cap 549), no person shall sell, import or possess any pCm unless it is registered. The maximum penalty is a fine of $100,000 and two years' imprisonment. The DH will seek advice from the Department of Justice on prosecution matters upon completion of the investigation, and will refer the case to the Chinese Medicine Council of Hong Kong for consideration of possible disciplinary action. "We will also consider referring the case to the relevant law enforcement agency to follow up on the suspected counterfeit product," the spokesman added. Members of the public who have purchased the above unregistered pCm should stop taking it immediately. Those who have consumed it and are feeling unwell should seek advice from healthcare professionals. People who have the product can submit it to the DH's Chinese Medicine Division on 16/F, AIA Kowloon Tower, Landmark East, 100 How Ming Street, Kwun Tong, during office hours for disposal.